Trilateral’s Data Science team has built interactive cloud-based dashboards to bring data-driven insights into modern slavery risk assessments. Trilateral Research is working in conjunction with the UK’s Ministry of Defence on Project Solebay, funded by Defence and Security Accelerator (DASA). The aim of the project is to develop a risk assessment methodology and tools to support the UK military’s response to modern slavery and human trafficking (MSHT). Trilateral’s Data Science team has contributed to the project developing the dashboards that will be hosted on Trilateral’s STRIAD platform. The dashboards provide data-driven insights to the MSHT risk assessment tool that will be developed within Project SOLEBAY by displaying both the factors that were identified to be correlated with MSHT in conflict zones and the global prevalence of MSHT. Furthermore, the dashboards can be used to support users in answering the risk assessment questions in order to evaluate the risk of MSHT. All the datasets used to build the dashboards are publicly available as open data, and a link to their sources is provided by the STRIAD platform. This allows users to access the raw data as well as base their decision making on a common set of data sources, rendering the way risk is measured more consistent across time. Below are two examples of these dashboards. 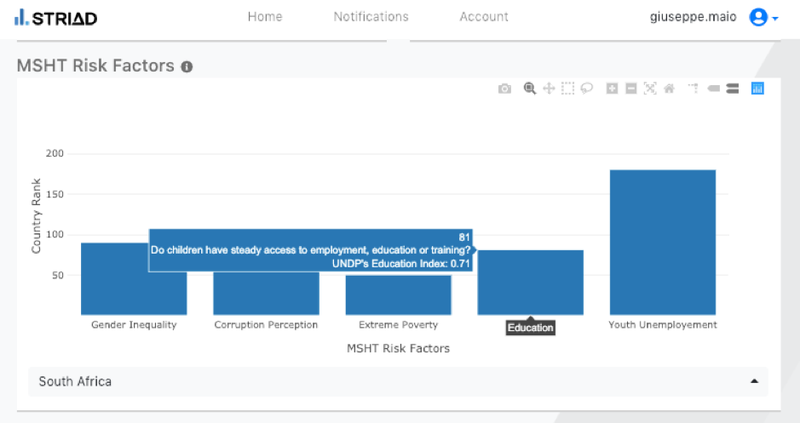 This bar chart dashboard shows five factors found to be associated with the risk of MSHT in conflict zones, namely gender inequality, corruption, extreme poverty, education and youth unemployment. The user is able to select the country of interest from a drop-down menu and visualise country-level information about these factors. Each country is ranked across the five factors: the higher a country’s risk level in a given dimension, i.e., gender inequality, the higher will be its ranking and the value of the bar representing that particular dimension. The bar chart above displays MSHT risk factors in South Africa. Youth unemployment appears in this instance to be a high-risk factor, with gender inequality, corruption, extreme poverty and education posing a comparatively lower risk. Country ranking allows for within- as well as between-country comparison. It will be possible to see, for instance, whether gender inequality constitutes a higher risk to MSHT than corruption within a country, as well as whether this represents a higher risk in country A than in country B. By hovering over the bars, the user can visualise the raw data used to calculate the ranking, obtain information on the data used, and visualise the risk assessment question the data is providing an answer to. By the end of the project in May 2019, between 10 and 15 MSHT risk factors will be included in the dashboard. 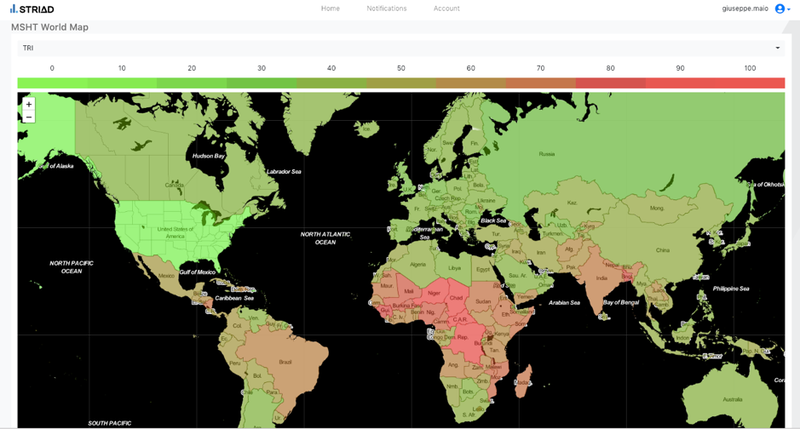 This world map dashboard helps visualise MSHT global data. The user can select various data sources to build the map from a drop-down menu: the option shown here is an overall MSHT risk indicator that we are working on, where green indicates low MSHT risk and red indicates high MSHT risk. Trilateral’s dashboards represent a useful addition to MSHT risk assessments as they allow users to visualise insights and combine intelligence-based and data-driven information, crucial to the evaluation of the risk of slavery. The dashboards will be presented in a video demonstration at the end of the project, and at the project’s final conference on the 14th of May at Queen’s Mary University, London.